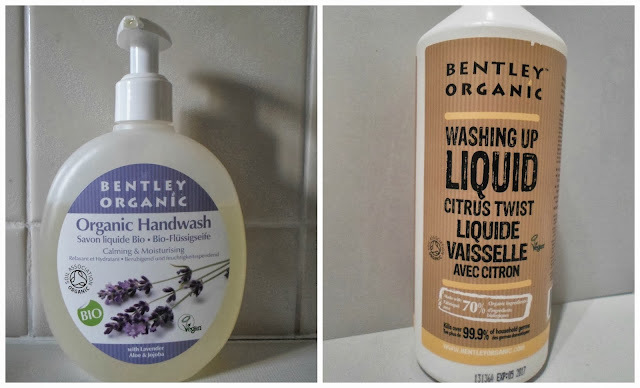 Bentley Organics has been on my radar for years and I finally got around to ordering a couple of products. If you are not familiar with the brand, Bentley Organics offer affordable products which are certified organic by The Soil Association. The range consists of body, hair and baby care plus household cleaning products. I bought the Calming & Moisturising Hand Wash and Washing Up Liquid. Sadly, Bentley Organic washing up liquid has been a huge disappointment. That opinion has been backed up by my boyfriend who I must admit does wash up more often than me, I have trained him well ;-) Previously, we had been using Greenscents which in comparison works brilliantly. The problem with the Bentley one is it loses cleaning properties too rapidly. You end up with a bowl of water without bubbles very quickly. It is fine for lightly solid plates but does not perform well if you have a heavy load with anything greasy like oven trays. I would not repurchase. If you would like to look at ingredients for these products they are listed on Bentley Organic's website. I bought these products from mypure.co.uk which is a site I have used a number of times and they offer free UK delivery. Has anyone else tried products from this brand? What did you think? I use Bio D washing up liquid. I was going to suggest trying it but can see from your lost below that you already have! I have tried a Bentley shampoo and a body wash which were both fine, nothing outstanding but they performed perfectly well for a budget range. I think Bentley is a great brand for those who want organic at an affordable price. I grabbed a bottle of their tea tree body wash for my mum when she had shingles. she loved it - as others have said, I think it's a good brand as an introduction to green products as it's such a great price. I love the "washing up liquid"